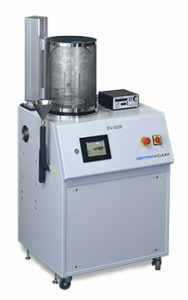 The DV-502 Thermal Evaporation system evaporates many of the metals and compounds involved in optical coatings, metalization, and electron microscope specimen preparation with no discernable contamination. The DV-502 also offers flexibility with a range of configurations available to meet your needs, including evaporation from a range of sources such as tungsten filaments, wire baskets, foil boats, baffle box heaters as well as carbon rod or yarn accessories. With the DV-502, you’ll achieve rapid cycle times – this system can reach the 10-6 torr range within three minutes. The contamination-free performance makes it a great choice for sample preparation for electron microscopy.